Squamous cell carcinoma is the second most common type of skin cancer. It is usually caused by past sun exposure and sunburn, especially in fair-skinned people. It is also more likely to be found in patients who are immunosuppressed. These skin cancers can be aggressive and destroy the tissue surrounding the tumor. In certain aggressive types of squamous cell carcinoma, or those that are left untreated, the tumor can become invasive and spread to the lymph nodes and other organs. For this reason, it is important to get early treatment. 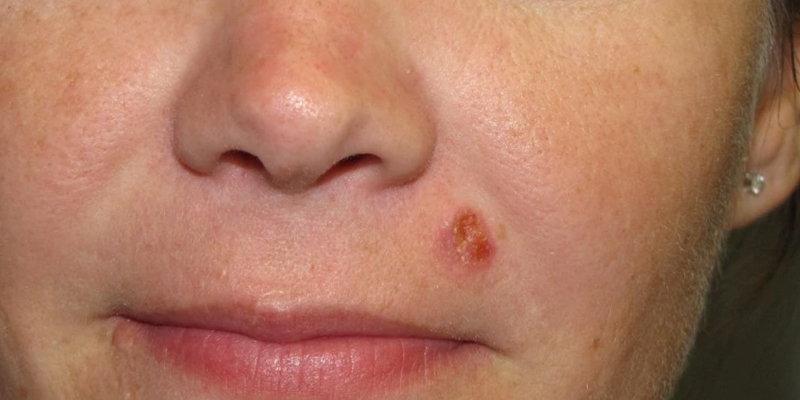 Squamous cell carcinoma is primarily found on sun-exposed areas such as the rim of the ear, face, scalp, lips, and mouth. It often begins as a small, sandpaper like growth called actinic keratoses. It then develops into a crusted or scaly patch with a red, inflamed base. It can also appear as a growing tumor, a non-healing ulcer, or just a crust. If a squamous cell skin cancer is suspected, it should be promptly biopsied to confirm diagnosis. After diagnosis, your physician will recommend the most appropriate treatment option. Some lesions can be removed by excision of the growth along with a small amount of surrounding tissue. The specimen is then sent out to a lab for confirmation that all of the cancer has been removed. If not, further excision will be necessary. In these areas, where preservation of healthy tissue is critical for cosmetic and functional purposes, SCARS Center skin cancer specialists recommend Mohs micrographic surgery as the best treatment option. During Mohs surgery, a dermatologist will remove the skin cancer one layer at a time, carefully inspecting each layer under a microscope until there are no longer skin cancer cells present. After complete skin cancer removal, the surgical defect (area of removal) may be reconstructed by the dermatologist or may require the expertise of a plastic surgeon. For patients who are not surgical candidates, radiation may be an effective treatment option. Certain types of squamous cell skin cancers are considered “high risk”. In these cases, further evaluation and treatment is necessary. Specialized tests, such as an MRI, CT scan, PET scan, or Sentinel lymph node biopsy, may be ordered to determine if the cancer has metastasized. If so, treatment may include radiation and/or removal of the invaded lymph nodes. Prevention of squamous cell carcinoma is best accomplished by using proper sun protection, practicing sun safety, and doing self-examinations for early detection. When found early and treated properly, the cure rate is more than 95%. Sun protection includes the use of a broad spectrum sunscreen first thing in the morning and every two hours throughout the day if you plan to be outside. Cover up with hats, sunglasses, and protective clothing. To practice sun safety, avoid peak hours of sunlight (10 am to 4 pm), and whenever possible, seek shade on a sunny day. Self examinations should be performed monthly. Refer to the ABCDEs of Melanoma, and notify a dermatologist if you see anything suspicious, especially pimple-like bumps that fail to heal after three weeks and scab or rash-like lesions that recur (come and go) over periods of time. Detecting skin cancer early is a patient's best bet for complete recovery. Early detection can also prevent patients from experiencing tumor growth, which may lead to more complicated or challenging treatment plans. In severe cases of surgical removal, temporary or even permanent disfigurement can occur. Skin Cancer can be detected in the home, by a hair stylist or in a nail salon, at a primary care appointment, or in a dermatologist's office. The best way to detect skin cancer is to be aware of the warning signs when performing monthly at home skin checks. Knowing what skin cancer may or may not look like, can help you determine when it is time to contact a dermatologist. In addition to monthly skin checks, be sure you are staying up to date with your annual or biannual dermatologic skin examinations. During self inspection, you suspect that you may have found squamous cell carcinoma on your skin, contact a dermatologist immediately.